Please be advised, a special event, BMW DALLAS MARATHON, is scheduled to occur the weekend of Dec. 9 – 10 in Downtown Dallas. 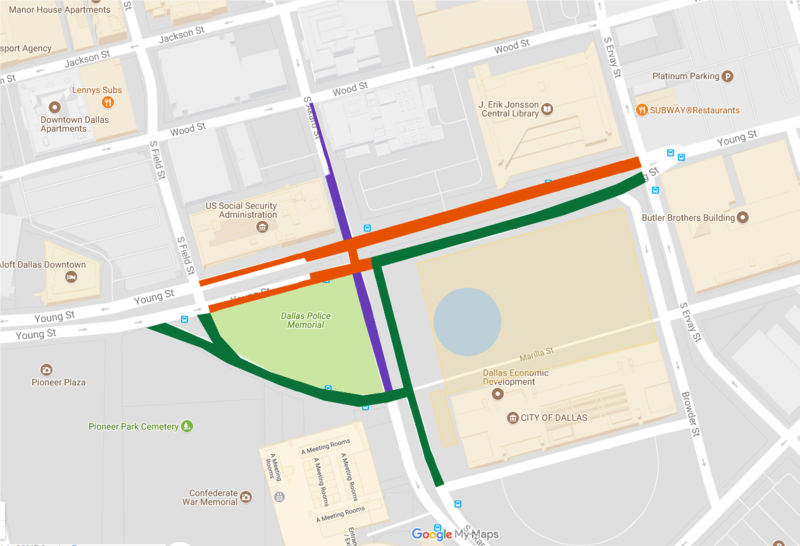 Staging and setup will impact traffic around City Hall beginning Friday, Dec. 1 at 10 a.m.
Akard Street – All southbound lanes closed from Young Street to Marilla Street all week beginning Friday, Dec. 1 at 10 a.m. through Monday, Dec. 11 at 7 a.m.
Saturday, Dec. 2 at 1 p.m. – Monday, Dec. 4 at 7 a.m.
Young Street – All westbound lanes closed from Ervay Street to Field Street and eastbound lanes closed from Field Street to Akard Street Lanes will be provided for through traffic during the peak hours of 7 – 9 a.m. and 4 – 6 p.m. 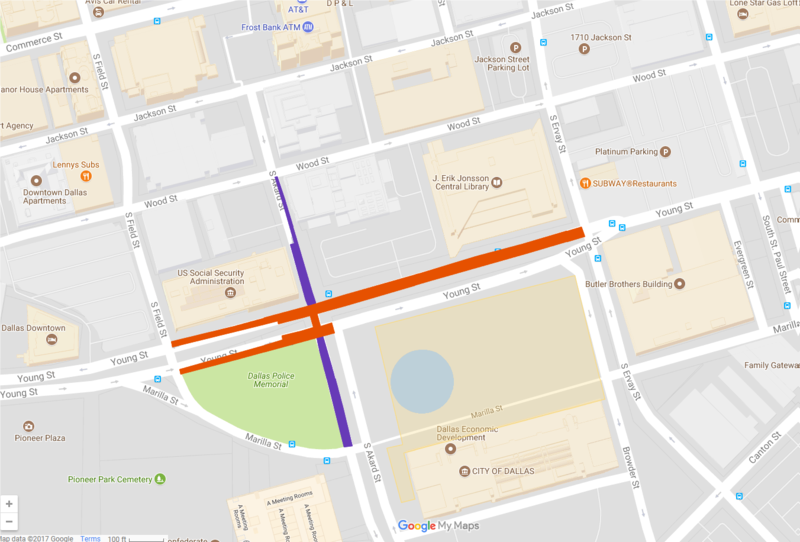 Lanes will be provided for through traffic during peak hours from 7 – 9 a.m. and 4 – 6 p.m.
Akard Street – Southbound lanes closed from Young Street to Marilla Street; all lanes of Akard Street closed beginning at 7 p.m.
Marilla Street – All lanes closed between Young Street and Akard Street Through traffic will be available during peak hours at 7 – 9 a.m. and 4 – 6 p.m.
Young Street – All lanes closed from Field Street to Ervay Street Lanes will be provided for through traffic during peak hours at 7 – 9 a.m. and 4 – 6 p.m.
Metered parking will be prohibited on westbound Young Street between Field Street and Ervay Street all week beginning on Saturday, Dec. 2 at 1 p.m. through Monday, Dec. 11 at 7 a.m.
Metered parking will be prohibited on eastbound Young Street between Field Street and Ervay Street beginning Thursday, Dec. 7 at 7 p.m. through Monday, Dec. 11 at 7 a.m.
Pioneer Plaza parking lots are closed beginning Thursday, Dec. 7 at 4:30 a.m. through Monday, Dec. 11 at 7 a.m.